Any word could mean different from its literal meaning because it depends to whatever meaning the sender of the message would want to relay. Sometimes, there are times wherein you would not directly say what you actually felt but would only use words that would only imply. One method of implying our feeling into the words we use is connotation. You may also see Examples of Verbal Irony. Words have their own basic definitions but it could have a lot various connotations depending on the emotions or meaning implied by the sender of the message. You may also see Assonance and Consonance Examples. Connotation, as defined by Merriam Webster, means that something suggested by a word or thing. It could also mean implication. It is also defined as the suggestion of a meaning by a word apart from the thing it explicitly names or describes. You may also see Examples of Situational Irony – Definition. The feelings or ideas meant by the sender of the message to a word is an additional meaning to its literal or main meaning. You may also see Examples of Situational Irony – Definition. 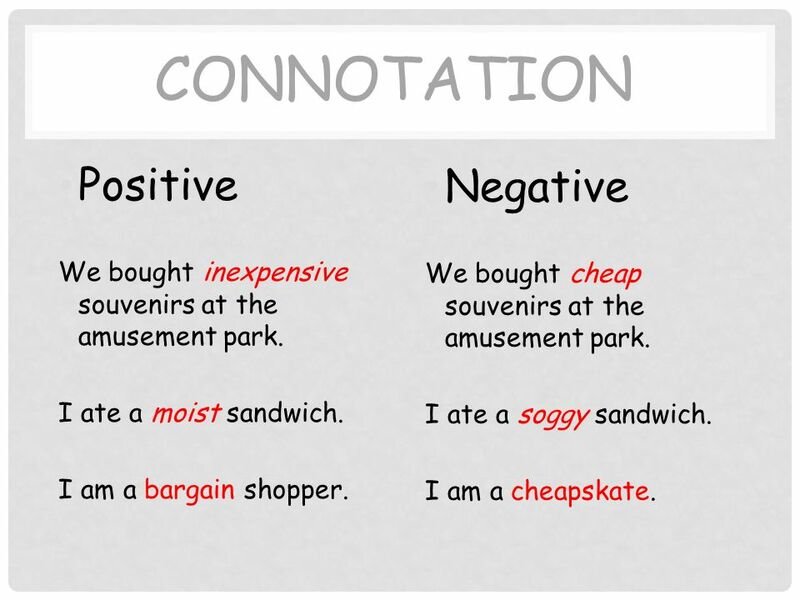 Connotations are classified as positive, negative, or neutral. It depends on how the words are used by the speaker or the writer. You may also see Examples of Situational Irony – Definition. Positive connotations are used to imply positive emotions and associations. You may also see Dramatic Irony – Definition and Examples. The aroma of the food being cooked by my mother in the kitchen wafts across the entire house. Aroma here means that it is inviting. You may also see Irony Examples for Kids. Negative connotations are used to imply negative emotions and associations. You may also see Antiphrasis Examples — Definition & Usage. The stench of the food being cooked by my mother in the kitchen wafts across the entire house. Stench here means that it is not pleasing to those and is not inviting at all. You may also see Satire Examples in Literature. Neutral connotations means that the word used is neither positive nor negative. You may also see Examples of Assonance for Kids. Connotation, particularly in literature, allows writer to broaden their horizons and dimensions. It means that their creativity is limitless and knows no bounds. If they would only write words with their own literal mean, it would not mean as much and can even sound bland to those who would be reading their works. It gives new meaning to words and could even help the writers explain what’s in their heads to their readers effectively. You may also want to read Examples of Assonance.